Our next fundraiser is here folks! We have lots of exciting activities for the children and should be a great family day out! We have Ross-county coaching for over 5's, music/songs/story telling workshop by Steve Sharpe from Drumfun, Zumba dancing for children and a seperate session for adults, bubbles the clown, face painting, bouncy castle and possible slide, mini assualt course with prize and our most popular activity..Family Drumfun lead by Steve Sharpe with special guests Peppa Pig and Fireman Sam, raffle, stalls, cafe. Below you have details and times but we strongly recommend that if children are interested, they book for the main activities now. The main activities are the Football coaching for over 5's where each child recieves a certificate, Zumba dancing for children with a short visit from Peppa Pig and Fireman Sam, Zumba dancing for Adults and Family drumfun in the afternoon lead by Steve Sharpe and mascots Peppa and Sam. Family tickets available on the day if required, which give unlimited access to all activities but if you are not booked on the popular sessions...you may not get a place as limited numbers so please book now. Family tickets are priced at £15 for 2 children and £2 for every other child. If you only have one child the family ticket price is the same but you will need to work out whether it is cheaper to buy this or pay for individual activities going to be used (please see above prices). Under 2's and adults go free! Family tickets do not include any food/refreshments/stalls/raffle. There are several of the above activities in which the proceeds of shall goto charities and small groups around the community. Go to the event page: COMMUNITY FEST! To be confirmed but definately not to be missed!! We shall be starting to produce our own CD with the help of Bob Pegg who shall record this for us as well as donating 60 copies to our group. He shall have a photo of the group printed on the cover and we are very lucky to have the talented Matt Sillars a guitarist, playing alongside the children. He has offered to give his time several weeks beforehand so he and the children are well rehearsed! On the CD shall be some Scouting songs, poems by the children and other great material. This is a lovely keepsake and possibly a nice christmas present. The CDs shall be on sale to parents on the run up to Christmas. Please keep watching the website for other up and coming events....believe me...there will be plenty!! We shall be holding a Christmas coffee morning where the children shall beable to decorate their own biscuit aswell as having a visit from Santa from 12pm. He shall have some chocolate coins to the children. Available will be our usual feast of baking, mince pies, mulled wine, shortbread, christmas cake, tea/coffee/hot chocolate and you shall be entertained by some singing from the children of Fairburn Scout Group! Don't forget to try your luck on the raffle and christmas Tombola! Don't miss it! Fairburn Scout Group and Ross County Football Club present Football Fun. 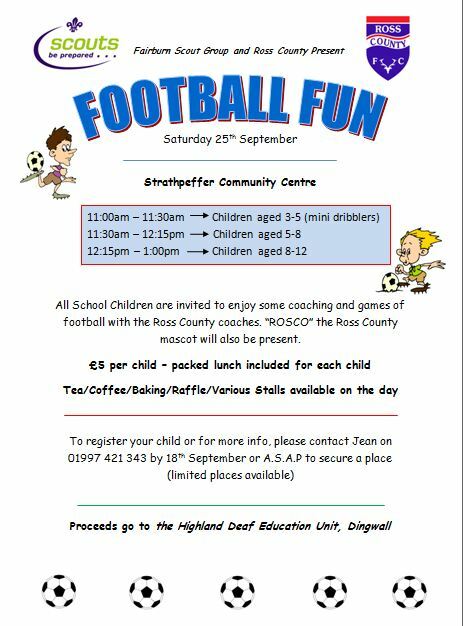 All school children are invited to enjoy some coaching and games of football with the Ross County coaches. “ROSCO” the Ross County mascot will also be present. £5 per child – packed lunch included for each child.